2014 was an action packed year with new personal storm chasing records. 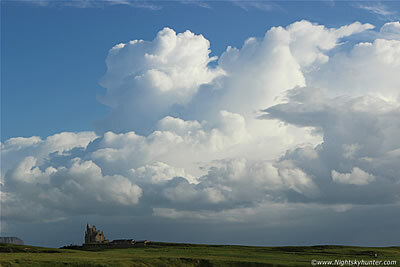 I spent hundreds of miles on the road in the hunt for storms in N. Ireland and the Republic within Co. Sligo and Leitrim. Highlights include the Mullaghmore off-shore storms, a probable HP supercell over Moneymore, high CAPE pulse storms in Co. Tyrone and a nasty hail storm on the Omagh Road. 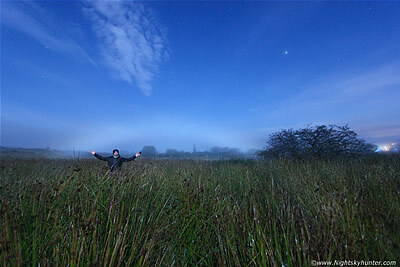 The year also provided other delights including an all night shoot at Monea Castle, star trails over Fanad Head lighthouse, a rare lunar fogbow, stunning sunsets, moonlit snow scenes, an epic aurora from Beaghmore and climaxing with an engagement proposal during a Christmas Eve aurora display at the Giant's Causeway. Check out all the action through these 19 reports which document my finest thrills and memories of 2014. Final image report of 2014 documenting early Winter snow adventures and photography across the Sperrins on December 27th and 28th. Highlights include a freezing mountain BBQ in the snow half way up Slieve Gallion at night, a hike to the summit of Benbradagh where we witnessed a stunning sunset and paraglider jump then climaxing with a wonderful scene on the back of the Sperrins outside Cookstown when we encountered a field full of Deer and Stags grazing in the snow in perfect light on the coldest day of the year. One page report with 17 images and 1 video clip. - REPORT. December 23rd/24th 2014 was the best Christmas Eve of my life when I proposed to my partner Roisin Laverty at the 60 million year old Giant's Causeway in the company of the stars and Milky Way while a bright aurora display bathed us in it's surreal light. 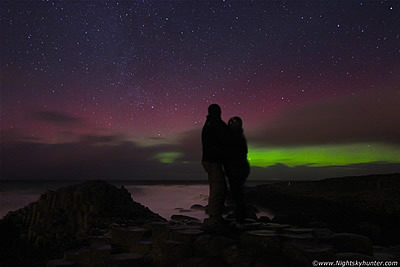 After a year of planning and against all odds an aurora appeared which was not forecast sporting green, red and pink colours on the very night I had planned my proposal, this all took place during the early morning hours of Christmas Eve exactly when Roisin wanted to get engaged which made for a truly magical night which we will never forget. One page report with 5 images. - REPORT. 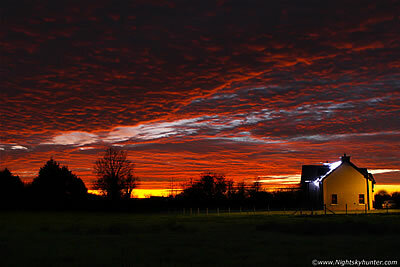 An unexpected sunset sky show unfolded during the afternoon of November 30th 2014 while I was visiting in-laws within the Creggan countryside near Lough Neagh. A remarkable long duration sunset with rich orange, red, and yellow colours manifested in the dusk sky complimented by a complex formation of altocumulus clouds. The sunset remained into evening twilight accompanied by the moon and brighter stars which was something I had never experienced before. It was a personal thrill to photograph this amazing sight standing within a pitch black field in crisp frosty air with a country house covered with Christmas lights for company. One page report with 7 images. - REPORT. 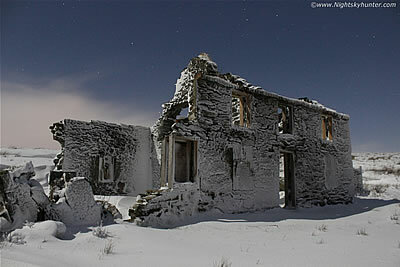 What began as a late night aurora hunt at the Co. Antrim coast on November 5th 2014 turned into a moonlit photo shoot of the famous and haunted 17th century Hazlett House in Castlerock. 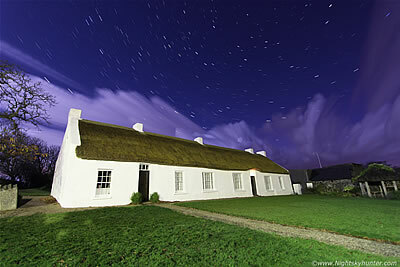 I had a wonderful solo 2am photo shoot and star trail session of this beautiful thatch roof cottage with stars and convective clouds aloft and dramatic natural lighting. I also did several time lapse sequences at Downhill Beach with two cameras in operation under the surreal light of a near full moon. One page report with 8 images & 1 video clip. - REPORT. At 03.00 on October 9th 2014 I drove to the top of Glenshane Pass in the hope of seeing lightning from distant storms over the Irish Sea however what I didn't expect was the manifestation of a beautiful and rare lunar fog bow. This was the first time I had ever captured a true lunar fog bow on camera and much to my great surprise the phenomena remained visible for almost one hour. I ended up having a thrilling night observing and photographing this ghostly bow all to myself from a field on this vast mountain with the surreal moonlit hills, stars and planet Jupiter for company. One page report with 6 images. - REPORT. Our first trip and night time photo shoot at the famous Fanad Head Lighthouse on the Co. Donegal coastline with my girlfriend Roisin Laverty and photography mate Paul Martin on Sept 27th 2014. 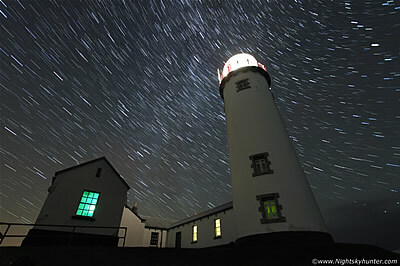 We spent hours at this beautiful location doing photography and observing the exceptional dark and transparent night sky which boasted stunning views of the Milky Way, green airglow and even a faint aurora complimented by night landscape imagery of the lighthouse with three star trail captures. 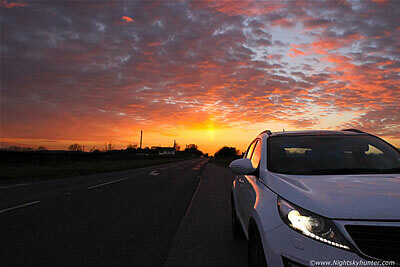 Fantastic night with 4 hours and 180 miles on the road. One page report with 12 images & 1 video clip. - REPORT. Detailed report documenting 9 hours of storm chasing, first in Omagh then a second evening chase intercepting the strongest thunderstorm of the year in N. Ireland in a well sheared environment with 1300 CAPE & LIs of -6. This organised storm with supercell traits made an impression over Co. Tyrone where I intercepted it's high precipitation core in Moneymore where it produced flash flooding which affected traffic and property. I chased the storm, punched the core & encountered incredible rotation & wrapping under the updraught base in Ballyronan then ended this 4 hour storm hunt near Toome watching lightning as dusk arrived. One page report with 12 images & 1 video clip. - REPORT. 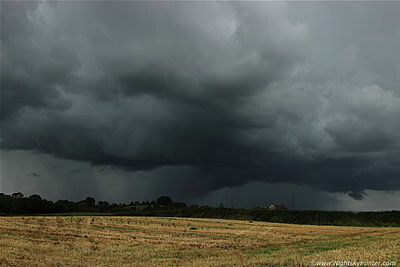 An early afternoon intercept of a high precipitation organised thunderstorm in a sheared environment over the Sperrins featuring dramatic cloud structure captured from a freshly cut hay field outside Desertmartin on a warm and humid August 3rd 2014 . My girlfriend and I chased the storm then punched the core between Tobermore and Maghera where it produced monsoon-like rainfall with flooded roads and lightning. A very successful, fun and highly photogenic local storm chase. One page report with 7 images and 1 video clip. - REPORT. June 10th 2014 was the final of four days in a row storm chasing with 1300 CAPE and LIs of -4. 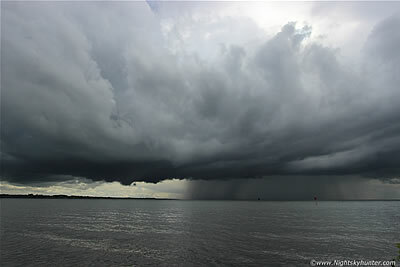 Storms fired early in the day and we watched several rumble away over Glenshane Pass then during the afternoon we intercepted an intense and beautiful surface based thunderstorm crossing Lough Neagh at Antrim Marina. 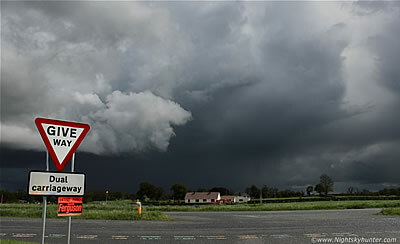 The storm boasted rock solid cloud structure and large scale rotation before coming onshore and hitting Antrim town were it made an impression on many with its frequent lightning and hail stones. One page report with 11 images & 2 video clips including time lapse footage. - REPORT. 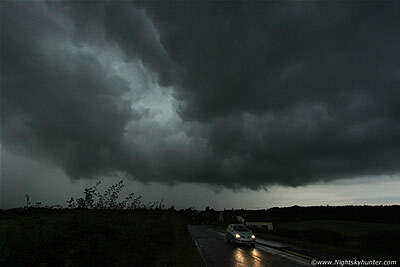 Third day in a row of storm chasing on June 9th 2014 when we chased across three counties with over 8 hours on the road. The day began with an early afternoon storm intercept with large wall cloud in Co. Fermanagh then multiple storms in Bundoran, Donegal, and ending the day to the S of Omagh, the storms we encountered were back-building very high precip cells which produced hours of intense torrential rainfall, road flooding, and frequent thunder and lightning then climaxing with significant rotation and an all-sky whale's mouth display. One page report with 16 images & 1 video clip. - REPORT. June 8th 2014 was the second of four days in a row of storm chasing with high instability storms boasting 1300-1500 CAPE and LIs of -4 and -5. We ended up chasing across the midlands of N. Ireland with particular focus on the lines of nasty storms between Cookstown and Omagh in Co. Tyrone which produced torrential rain, dangerous and frequent close range cloud to ground lightning and an all-sky whale's mouth display. The highlight of the day was the big storm over the Omagh Road with green precip core which dropped hail stones larger than marbles accompanied by pink c-gs which made for a thrilling chase across the countryside. One page report with 15 images & 1 video clip. - REPORT. 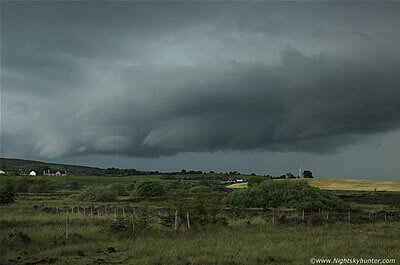 June 7th 2014 was the first of four days in a row of thunderstorms across parts of Ireland and N. Ireland. This was a very successful storm chase day with 12 & 1/2 hours on the road in a very unstable environment loaded with 1300-1500 CAPE and LIs between -4 and -5 which produced intense thunderstorms which we intercepted at the Mullaghmore coastline in Co. Sligo. We got treated to beautiful thunderstorms over the ocean in full sunshine with close range lightning followed by a high based funnel cloud. I also caught my first ever daytime lightning bolt on camera making this a thrilling day to remember. One page report with 13 images & time lapse video footage. - REPORT. Best chase of the 2014 season to date when my girlfriend and I documented a spectacular convergence zone thunderstorm from Brenbradagh Mountain outside Dungiven on May 26th. We experienced the entire life cycle of this strong thunderstorm for over two hours without having to move position once while staying completely dry in sunshine as the storm grew and evolved rite before our eyes producing a funnel cloud, close c-g lightning, and the best shelf cloud and storm structure I have seen for years. 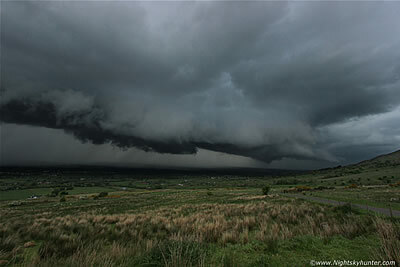 Also included is a funnel cloud over Donegal Bay captured by my Dad from Rossnowlagh on the very same day. 21 images & 2 video clips. - REPORT. Account covering several storm chases in the local area starting on May 10th 2014 when my girlfriend and I chased in Cookstown intercepting a storm near the carriageway which moved over Lough Neagh producing lightning, the day was notable for its widespread convection, dramatic cloudscapes & HP showers. 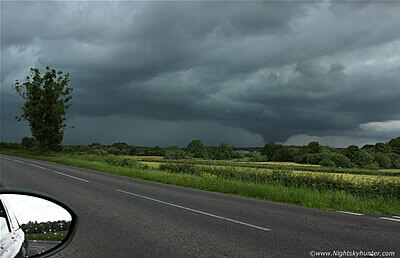 The report continues from May 13th on a day when nothing significant was anticipated until I was surprised by a slender funnel cloud which appeared at close range near my home while spinning over the Coleraine road from a tall updraught which grew over the Maghera area marking my first funnel catch of 2014. One page report with 16 images & 2 video clips. - REPORT. Detailed report documenting four days of long distance storm chasing between April 23rd and April 30th 2014 covering 40 hours of chasing to Fermanagh, Leitrim & Sligo in pursuit of early season thunderstorms. The report documents various road scenes including several busts, however highlights include the high based hail producing cell in Fermanagh and the stunning unexpected sun pillar and sunset event on the Omagh road outside Cookstown which made the trip a success. 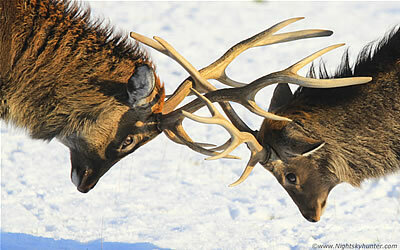 One page report with 15 images & 3 video clips. - REPORT. 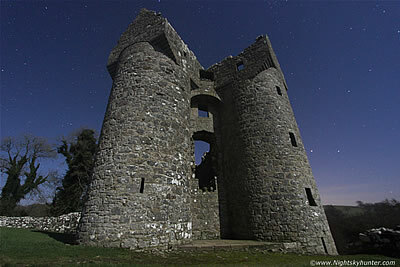 Awesome all-night photo shoot in Co. Fermanagh on March 11th 2014 photographing the beautiful 17th century Monea castle located on the W side of Lower Lough Erne along with photographer Paul Martin. The castle provided an excellent photo opportunity on the clearest night of the year bathed in brilliant moonlight and surrounded with stars aloft before becoming engulfed in eerie pre-dawn moonlit fog. Wonderful photo shoot on an extremely atmospheric night and a location in which we will no doubt be visiting again in the future. One page report with 15 images. - REPORT. The finest aurora display I have witnessed in over a decade announced itself in the evening sky after sunset on Feb 27th 2014 when a CME delivered a glancing blow which generated a stunning G2 geomagnetic storm. The aurora almost reached the zenith with striking green and red colours with extremely rare orange rays which gave the impression of a crimson veil or glowing fire in the sky, even the frost on the ground was glowing red. 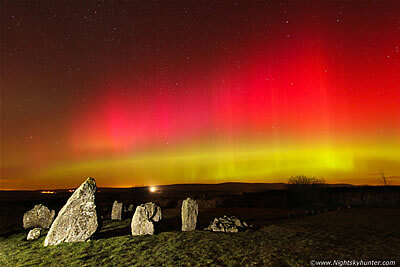 This report documents in detail the events leading up to this storm beginning with a storm chase to the Antrim coast then the rapid dash south where I met up with Paul Martin and Jude Browne at Beaghmore stone circles and Lough Fea in Co. Tyrone where we watched in awe as the aurora went into outburst, this was a night we will never forget. One page report with 14 images. - REPORT. 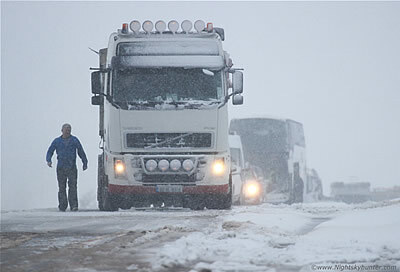 Feb 14th 2014 was an action-packed afternoon on Glenshane Pass when my Dad and I were involved in a que packed with several hundred vehicles with spun-out trucks trapped in the snow and ice on this famous winter road. This was quickly followed that very same night by a photo shoot to Glenariff Forest Park in Co. Antrim where photographer Paul Martin and I photographed the beautiful waterfalls under the surreal light of an almost full moon which made for a magical and eerie experience. One page report with 14 images. - REPORT. 2014 storm chasing and night sky video highlights presentation featuring a selection of still images, video footage, time lapse video and star trail imagery from the many photo shoots and chases I did during the year in both Ireland and N. Ireland covering aurora, sunsets, night landscape, funnel clouds, moonlit snow, thunderstorms, waves, atmospheric optics and much more. The video is 18 min's in duration and best viewed at 720p HD or 1080p HD for the full experience.